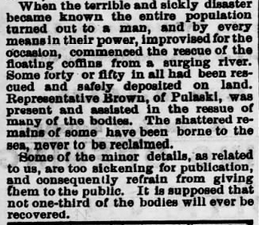 The following story, published in 1873, describes a rather gruesome side effect from the flooding of the Arkansas River near Little Rock-- the washing away of more than five hundred bodies from an old graveyard. 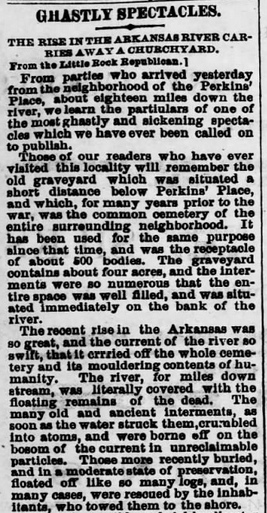 According to the Little Rock Republican, the river "for miles downstream, was literally covered with the remains of the dead", many of which could not be recovered. 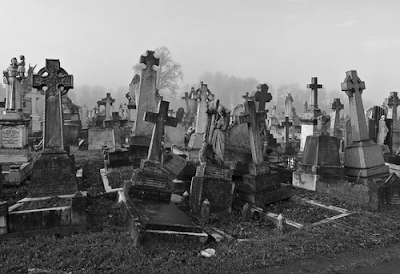 As a result, bones and body parts in various stages of decay and decomposition were strewn throughout the region, and are probably still out there waiting to be found. 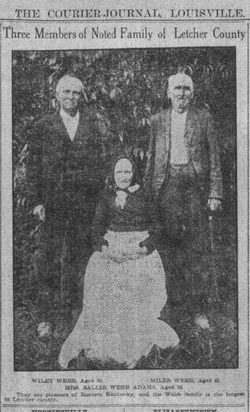 The more recently buried, according to the report, "floated off like so many logs" and were towed to shore by volunteers. However, our favorite part of the story is the last paragraph, which states that some of the minor details are "too sickening for publication", which, of course, leaves a great deal to the imagination.